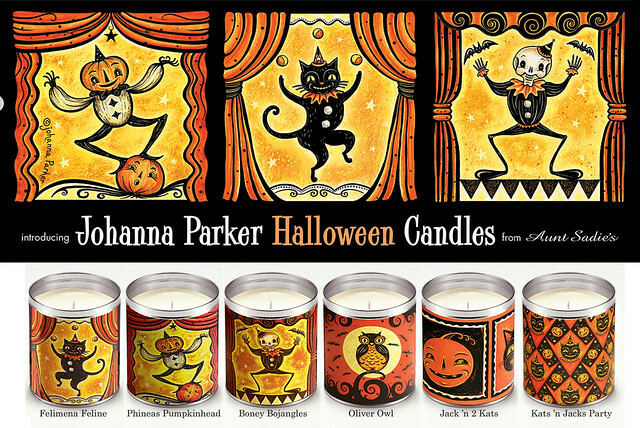 I am excited to announce that I have a NEW Halloween & Holiday illustrated candle line hand-crafted by Aunt Sadie's Candles in Vermont! And, in celebration of this fun collaboration, I am hosting a double GIVEAWAY! To Enter to WIN, simply answer a question and leave your feedback via the comments section here on my Blog! I am also giving away another illustrated Halloween candle to the folks that follow along and leave their feedback on my Facebook Page. You are invited to enter both giveaways. If you wish, you can EMAIL me as an alternative, and I will post your comment for you. and products based off of your wishes. For the BLOG portion of this Giveaway, we now have a WINNER! to see me develop & create?" That's easy enough! I'd love to read your replies, and I will be randomly choosing a winner from the comment entries on each site. So, that means 2 winners! And, winners will be drawn on Monday, June 15th! These whimsical candles are hand-poured by artisan candle-makers at Aunt Sadie's historic farm in Lunenberg,Vermont. An 1865 farmhouse and old horse barn are the country headquarters for this family-run, small-town business. Each tin candle from my collection includes a clear lid and is adorned with a Johanna Parker illustrated wrap. They make unique, fun and functionional gifts to friends and family and to yourself! I am thrilled to be part of the team, and I am excited for you to see my designs GLOW! Above is a peek at Aunt Sadie's promotional postcard for my Halloween Collection! Thank you for your interest & support in American made!